Brexit: What does 12 March 'meaningful vote' date tell us? There's now another date for your Brexit diaries. Let's face it, many big days have come and gone. But in an opaque process, even the selection of dates tell us something of what's going on. And the prime minister's announcement today of the next meaningful vote by 12 March tells us rather a lot about a game of chicken, a tango and a cunning wheeze. This will make sense soon, I promise. First off, MPs who are pushing the prime minister to rule out the idea of leaving the EU without a formal deal are already busy being professionally cross this afternoon that the government won't put its plan to Parliament to reject or approve this week. It's true that playing for time is a powerful, if cynical, political strategy and the Labour Party - and lots of Conservatives too - are annoyed that Downing Street seems to be dragging its feet like this and won't give MPs a formal thumbs up or thumbs down vote for more than another fortnight. That's even though we are still, of course, heading day by day closer to our departure date. But it won't stop the senior MPs Yvette Cooper and Oliver Letwin, still pushing for a vote next week for their own bill that would force the government to delay Brexit if they don't have a deal in place by... guess when? 13 March. Oh look - the day AFTER Number 10's new deadline. Here, the date of 12 March suggests that the government is, as one source suggested, "planning for every eventuality". In other words - they think it's likely MPs might indeed vote this week to extend the process if a deal hasn't been done. Ready for the cunning wheeze? The prime minister did not want to answer questions on the plane about what she would do in that circumstance. It's absolutely plain that she doesn't want to delay Brexit in any way. An extension, in her view, doesn't solve any of the dilemmas. But she has also never actually 100% said that she would never, ever, ever end up doing that. Simply, she can't, because Parliament might take the decision out of her hands, or the prospect of a defeat might force her to move. Indeed, a senior figure in government is convinced that Number 10 will find a way, if the votes are stacking up, of taking leaving without a deal off the table by implication, next week. They said it would be "difficult to envisage her actually saying it". Theresa May is not about to dance down Downing Street declaring that she would never take us out of the EU without a deal. But she might try to pre-empt a defeat in Parliament next week that would force her to do just that. 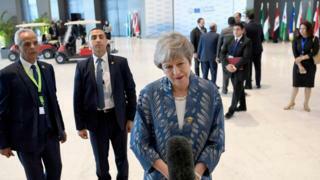 The source suggests, if for example, the PM was to make a point about the executive's "constitutional deference to the Commons" that might just do the trick - avoid losing another Brexit vote but make it clear that if it's there is a majority in Parliament to stop us leaving without a deal when the meaningful vote come back, she would be bound by it. One cabinet minister tonight believes and hopes Number 10 is preparing for that kind of concession - "that would be the clever thing to do" - with the threat ever present of course that if she doesn't, she really may this time lose more ministers from her government. Of course that might bring Brexiteer fury raining down on her head, but Number 10 might find deferring to the Commons, a cute defence against those Eurosceptics who've argued for so long for Parliament to be sovereign. In other words - Theresa May does not want to countenance delaying Brexit, not for one moment. But she might find next week she has to, at least by implication, accept she might have no choice. And more cunningly (perhaps), because Number 10's new deadline is 12 March, she can carry on trying to tweak her Brexit deal at the same time. Love the idea or hate the idea, just as at home, EU leaders are now openly talking about such a delay because it is not, as Leo Varadkar said, "not a game of chicken, we're not playing poker". Sure, there is political brinksmanship, but on all sides, as our planned departure date comes nearer, the seriousness of the potential consequences come into sharper view. And if there were to be no deal, a 12 March vote would give the government a few weeks to rush through as many measures as they could to smooth out possible disruption. It would also, in theory, give the government a couple of weeks to theoretically have another go - a Meaningful Vote 3. Brexit video explainers: What is it all about? How the second vote goes will in large part depend on the concessions, tweaks or extra legal verbiage the prime minister manages to achieve. Remember the big problem is still the Irish backstop - the legal guarantee in the deal that there won't be a return to the hard border between Northern Ireland and the South. Brexiteers fear that if it were ever triggered the UK would be stuck in a close relationship with the EU forever. That's why therefore Number 10 and the attorney general are working on extra assurances to underline that it would be temporary. But of course, they need the EU to agree. But again the date tells us something about how this might unfold. 12 March is before the next planned summit with the other EU countries. Planning the vote for then suggests that Number 10 is working on a plan with Brussels' top brass that would be signed off theoretically, then they hope voted through Parliament, and then, in the words of one Number 10 source, "rubber stamped" by the final leaders' summit in March. This makes sense of the continued insistence from the EU side that the UK has to "show a majority", before the 27 will approve something. There's an emerging sense in Downing Street that the additional assurances to the backstop are likely to be agreed with President Jean-Claude Juncker, who said, arriving at the summit tonight, "you need two to dance tango. I know how to dance, ok?" The final deal therefore, that might be put to Parliament, might be conditional. Having been burnt before, EU leaders won't collectively put their names to it unless and until it's been agreed with the EU Commission, then approved by Parliament, then on their desk. As ever with Brexit, take this with a hefty dose of caveats. Any or all of the moves the prime minister might take will be met with heavy criticism from the many different tribes with skin in this game. Any or all may not come to pass. But the choice of 12 March does tell us more about where the prime minister might go next. Could new group reshape political tribes?